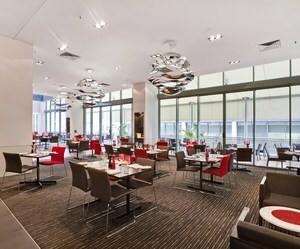 The Pantry, Novotel Brisbane's main on-site eatery, offers alfresco dining and food to make you feel like you’re dining in your own home - it’s fresh, seasonal and delicious. With a sumptuous breakfast buffet and seasonal a la carte dinner you will be sure to feel at home at the pantry. To be paying $38 for a steak and to have a third of the steak gristle and fat ( unedible ) is asking too much. Also $18 for desert ( mousse ) is not worth it. It had started to water ... 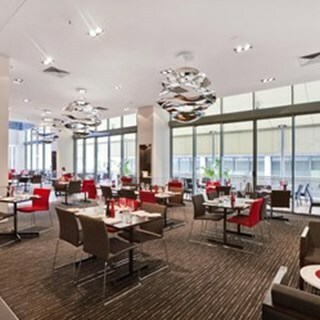 It's as well I am am a Platinum Accor Plus member and so I would never dine their again. When I booked I was asked if it were a special occasion, I answered it was a birthday. Yet nothing was mentioned  on arrival or during dinner. So why ask?. The following staff members are to be commended for their exceptional & professional standard of service, please let them know. Jess (Reception) absolutely amazing, Aaron(Bartender) totally friendly and most helpful. Wayne (breakfast staff) well done! Please let these staff member know our feedback thank you so much Novotel. One of the best Novotel total experiences I have had in over 20+ years of continuous Advantage Plus & Accor Plus Membership! I have nothing but high praise for the presentation and quality of the food and the friendly attentive service at dinner recently in the Pantry Restaurant. The pecan pie dessert was a standout. We enjoyed the seasonal menu. Presentation is fabulous, by just reading the menu is enough to make our mouth water. Lacking on the kids menu. When clearly stated jasmine rice, yet turns out is semi dry long-grain rice. Kids corn was served 80% burned and undercooked.. kids are fussy eaters, hence most the kids menu we ordered was untouched..
Service needing serious improvement, three waitresses running around different tables, does not have a set distination, not sure what each other is up to on the service with each customer... they could be better organized with set allocation on tables.. so they could focus on their customers need.. we stood there for over 5 mins with our baby while our waitress said I will be right back with a baby chair, yet turn around, she got called to another table to get their order .. Loved breakie such a large choice. Tne dinner was scrumptious, great size. Superb flavours. Food was delicious! Great atmosphere! Danishes fantastic - 5 stars to pastry chef! Some of the hot food was lukewarm especially the baked beans - maybe the heating sensor not working two days I was there. Scrambled eggs so overdone watched waitress bash them trying to break them apart. Hence opted to order poached eggs two days running. First day - they were "hard boiled". Second day not that much better even though I asked for them to be medium. Machine coffee not bad but miss barista. Good to see your gluten free selection has been expanded. unfortunately at the end of the night after paying our $330 bill and departing the F & B supervisor came chasing out after us at the lifts yelling at us in front of my family and 6 other people waiting at the lifts accusing us we did not pay for 2 beers - it was embarrassing and offensive the way she went about it. She could have approached me privately and quietly to ask the question instead of yelling across the lobby of lift area. All she had to do was check the with cashier to see i had submitted two drink vouchers with the meal for the two beers - there was no apology from her for the outburst. I reported the incident to hotel manager. While the F & B supervisor was accusing us we missed our lift to our room and my wife who is disabled had stand supported for another 5 minutes while we waited for another lift. Left me with a bad experience from the poor management of the restaurant. The supervisor needs some customer service training. The best Accor restaurant in Queensland; besides the always the great delicious food the key difference from this restaurant is the staff. The manager always have nice suggestions of wine to match the dishes plus a impeccable attention to detail and by that an outstanding customer service. This service should definitely be an example for all others restaurants. Thank you one more time for the great experience. Really good food and fantastic customer service. Really recommend. Food was great and we had an excellent night. Service was friendly and he happily answered all our queries, and checked when he didn't know. There is an opportunity to follow through more re drinks and desserts, coffees. The best dish was pulled beef potato skin. The staff were friendly and nice. The only disappointment was the lamb skewers, as they were a bit undercooked and chewy. Overall it's a nice place and will definitely go back for the potato skin! Fabulous waiter, recommended good wine , delightful fresh ingredients and interesting flavours. Food was cooked to perfection, and the servings were quite large, so take a healthy appetite with you. Highly recommended.